We study to seek truth, and Truth Himself declared to us, “Blessed are the pure of heart, for they shall see God” (Matt. 5:8). Only when our heart, our conscience, and our will are pure, free from the distractions of temptation and the stains of sin, can our intellects gaze clearly upon truth. Prudence is the virtue that guides the moral virtues of temperance, fortitude, and justice, but it also depends on them. It is through the exercise of virtues such as self-control and courage that we can discipline our minds to focus on what is truly important and then act to achieve it. Moral virtue strengthens and sharpens our powers of understanding so that they may better “penetrate into the heart of things.” We will not achieve the heights of intellectual virtue, of knowing the true in the manner of St. Thomas Aquinas, without at the same time climbing and growing in the moral virtue of striving to seek only what is truly good. Of course, we all have different bodies, temperaments, and dispositions, and some of us, by nature, suffer greater temptations to impurity than others do. As a young man, St. Augustine famously prayed that God would give him chastity, “but not yet.” St. Paul wrote of the war between the flesh and the spirit, and how easy it is for carnal, enfleshed human beings to leave undone the good things we want to do while doing the evil things that we hate (see Rom. 7:13–22), echoing Christ’s warning to Peter that in matters of temptation, “the spirit indeed is willing but the flesh is weak” (Matt. 26:41). 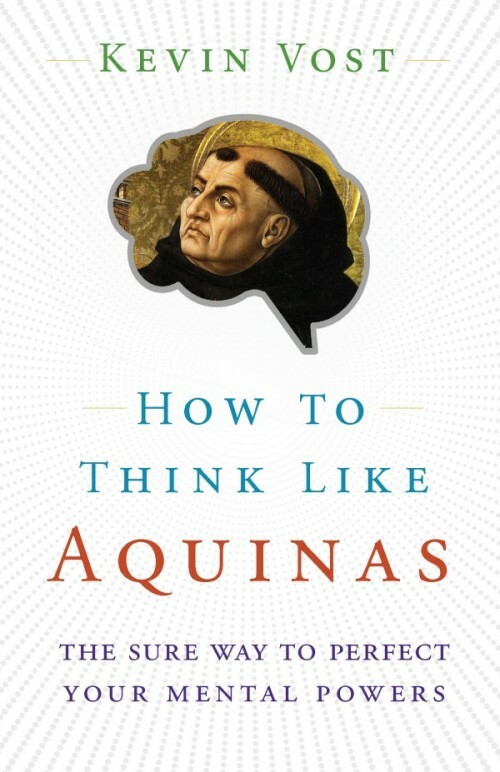 This is a preview of How to Think Like Aquinas. Click image to learn more. Lust, the most powerful challenge to the virtue of temperance and purity of heart, thrives on singulars, especially visual images of particular enticing bodies. Unfortunately, advertisers and the purveyors of popular media know this so well that we are perpetually bombarded by images purposely designed to arouse our lusts, be it on television shows and commercials, in movies, in newspapers and magazines, or plastered greater than life-size on unavoidable roadside billboards. What, then, are we to do? The couple blessed with the sacrament of marriage can treat each other with special loving attention as singulars, but they, too, must love rather than lust, loving each other in the flesh, yet never seeing or using the other as mere flesh alone. St. Thomas was especially adept at practicing temperance because of his focus on the very highest of universals, the divine things of God. Spiritual sloth, he wrote, paves the way for lust and intemperance, because he knew that “those who find no joy in spiritual things have recourse to pleasures of the body.” To curb lust, then, let us focus most on the highest things of God, from which flows love, not lust. The pure of heart, after all, will see God. Do not imagine that you will overwhelm the demon of fornication by entering into an argument with him. Na­ture is on his side and he has the best of the argument. So the man who decides to struggle against his flesh and to overcome it by his own efforts is fighting in vain. The truth is that unless the Lord overturns the house of the flesh and builds the house of the soul, the man wishing to overcome it has watched and fasted for nothing. Offer up to the Lord the weakness of your nature. Admit your incapacity and, without your knowing it, you will win for yourself the gift of chastity. Of course, it is not only sins of lust that can lead to an impure conscience. If we are to think like Aquinas, we must strive against all manner of sin, to build all manner of virtue, and to ask God to help us in battle; we must also thank Him when we emerge victorious. In fact, this leads us to Thomas’s next precept. Prayer is the Christian’s fundamental means of acquiring virtue: “If any of you lack wisdom, let him ask God, who gives to all men generously” (James 1:5). Indeed, St. Thomas clearly practiced what he preached and taught, crediting his vast learning more to prayer than to study! Hear the words of Thomas’s close friend, Brother Reginald of Piperno, quoted at Thomas’s canonization proceedings: “When perplexed by a difficulty he would kneel and pray and then, on returning to his writing and dictation, he was accustomed to find that his thought had become so clear that it seemed to show him inwardly, as in a book, the words he needed.” Might we all develop such a prayerful practice to overcome writer’s (or studier’s) block! Only in prayer do we make direct contact with that ultimate Teacher and Maker of all Truths, and that is why it should undergird all our studies. Thomas notes that we reach truth in two ways. In the first way, we receive truth from outside ourselves, and to access such truths directly from God, prayer is our means. Indeed, he cites the words of Wisdom 7:7: “I called upon God, and the spirit of wisdom came upon me.” As far as gaining truths from other people, our means are hearing the spoken word and reading the Holy Scriptures. The second method in which we reach truth through our actions requires personal study and meditation. Prayer then, is our God-given means of acquiring His wisdom. In expounding on the various acts of the virtue of religion, Thomas writes, “According to Cassiodorus, prayer (oratio) is spoken reason (oris ratio).” Speech and reason are powers of the intellect, so prayer is not an act of the lower powers of sensation we share with other animals, but of our uniquely human intellectual powers. Prayer is the province of the rational animal, and that animal is man. Thomas notes that prayer starts with and is essentially “the raising up of one’s mind to God.” Further, the “parts” of prayer include supplications (humble requests) and thanksgiving for blessings God has provided. of the universe with such artful skill . . .
direct its progress, and bring it to completion. The lesson could not be clearer: if we are to think like Aquinas, then we must pray like him, too! Editor’s note: This article is from a chapter in Dr. Vost’s How to Think Like Aquinas, which is available from Sophia Institute Press.